I knew I wanted to be a pro cyclist when: As soon as I started racing as an amateur, I knew I wanted to be a professional cyclist and race at the highest level. Greatest racing memory: When I won Stage 5 of the Presidential Cycling Tour of Turkey in 2016 ahead of Andre Greipel. Race I dream of winning: As an Italian sprinter, Milan-San Remo would definitely be a dream to win. I have been very close before so I would also love to win a stage of the Giro d’Italia. If I wasn't a pro cyclist: I don’t know but maybe I would have continued studying and seen what happened from there. 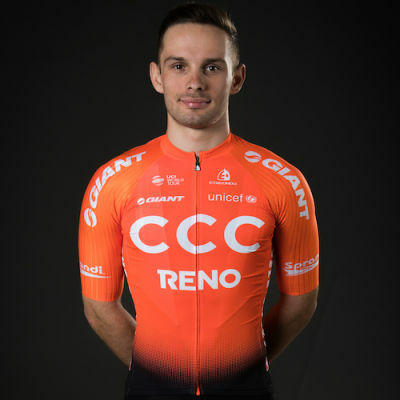 At just 24 years old, Jakub Mareczko already has 40 wins to his name at the professional Continental level and as he steps up to the UCI WorldTour, the Italian sprinter will diversify CCC Team’s roster. The majority of Mareczko’s victories have come in Asia over the past three seasons, but his international success also includes stage wins at Settimana Internazionale Coppi e Bartali and the Presidential Cycling Tour of Turkey in 2016. Mareczko has also shown his potential in grand tours. He has three second-place finishes at the Giro d'Italia the last two years against some of the best sprinters in the world.